Ramblings of a Daydreamer: SOMETHING IN THE AIR Release Day! SOMETHING IN THE AIR Release Day! Something in the Air hits virtual bookshelves today! I’m so excited that Rose and Declan’s story is finally out in the world. This book has been a long time coming. I started writing it in the summer of 2013 and got stuck, so I decided to set it aside for awhile. ‘A while’ turned into almost two years, during which I wrote and published several other books. When I finally went back to Something in the Air, I had an amazing critique partner who helped me get through the issues I was having with the story so I could finally finish. After over two years of carrying Rose, Declan, and the other characters in my mind, this book feels like a labour of love. I really do love this story about self-discovery, friendship, love, and following your dreams, and I hope you’ll love it, too! 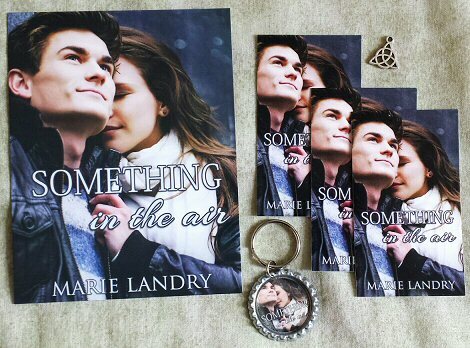 The Something in the Air release week book blitz, hosted by YA Bound Book Tours, started yesterday. The blitz includes a special giveaway with goodies related to the book. You can check out the main blitz post and enter the giveaway here. Annnnd I have another giveaway! 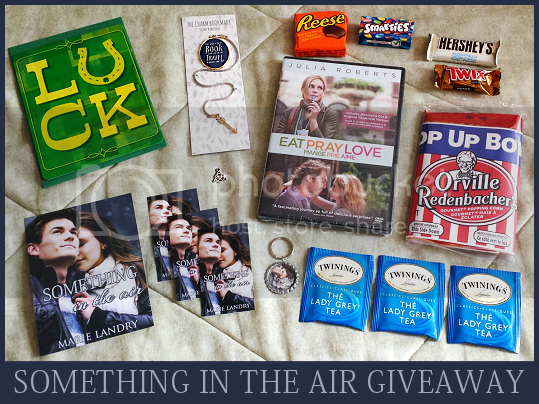 Want to win a Something in the Air swag pack that includes a signed postcard, some mini bookmarks, a bottle cap charm (made by Jessica Sankiewicz - aka my bestie! - at Impulsivities), and a Celtic knot charm? Enter below! Open internationally. Thank you so much to everyone who has helped me get here, whether it's by reading early drafts, cheering me on while writing, leaving comments on the blog, buying my books, reading and reviewing ARCs...it all matters, it all means the world to me, and I'm so grateful. Congrats Marie! I enjoyed reading it and offering funny notes during my critique. It was a great story. Congrats Marie! I'm So happy for you!